On the sixth day of Itikaf City being held under the banner of Minhaj-ul-Quran International, Shaykh-ul-Islam Dr Muhammad Tahir-ul-Qadri spoke to over 15 thousand ‘Mutakifeen’. 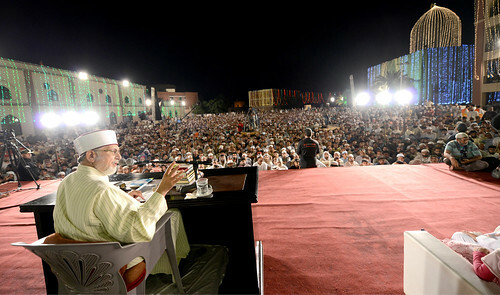 This address of Shaykh-ul-Islam was also meant for overseas audience to mark the holy occasion of Layla-tul-Qadr there, which was broadcast live around the world by www.minhaj.tv. Speaking on “Excellence of morality”, Shaykh-ul-Islam Dr Muhammad Tahir-ul-Qadri said that spiritualism is a combination of sincerity of intention, productive knowledge, pious deed and excellence of morality. He said that intentions lead to actions, actions lead to correct knowledge and if knowledge has been acquired for the sake of Allah, it becomes productive knowledge. Dr Muhammad Tahir-ul-Qadri said that it is unfortunate that we have confined the scope and vast meaning of spiritualism to performance of a few rituals and a mix of strange terminologies. The people have forgotten the essence of spiritualism. “That which exposes the heart and soul to spiritual taste is real spiritualism. He is the Sufi in the field of spiritualism who is a fountain-head of morality and mercy and whose heart and personality are tender and whose words have palliative effect on the spiritual disorders,” he held. Shaykh-ul-Islam said that such was the excellence of character of the Sufis that they would not even show a non-Muslim guest the door who would attend their company. Sufi is like water and he quenches the thirst of those who drink this water. He said that there is a saying of Hazrat Junaid Baghdadi (RA) that spiritualism represents the excellence of Allah’s morality. He said that a Sufi is a person whose heart is like that of Hazrat Ibrahim (RA) who presented the sacrifice of his son on the commands of Allah Almighty without asking any reason. He in whose person are found the manners of the Prophets is Sufi. Shaykh-ul-Islam said that he whose heart has been purged of every kind of malice and who extends excellent treatment to the creations of Allah is a true Sufi. He said that man’s riddance of every bad quality and adoption of every positive manner/quality is spiritualism. Dr Muhammad Tahir-ul-Qadri said that knowingness of and nearness to Allah Almighty is a prerequisite of moving on to the path of Allah Almighty. There is a Hadith which says that many saints and Friends of Allah would get high stations, not due to their worships such as prayer and fasting etc. but these stations would be conferred on them in recognition of their virtue of munificence or generosity. Such people, he said, are not the cause of hurt to anyone, rather they become the source of mercy and affection for the people and these are the very people for whom Allah opens the doors of His unlimited mercy. Shaykh-ul-Islam’s address came to an end at 7 a.m. (PST).